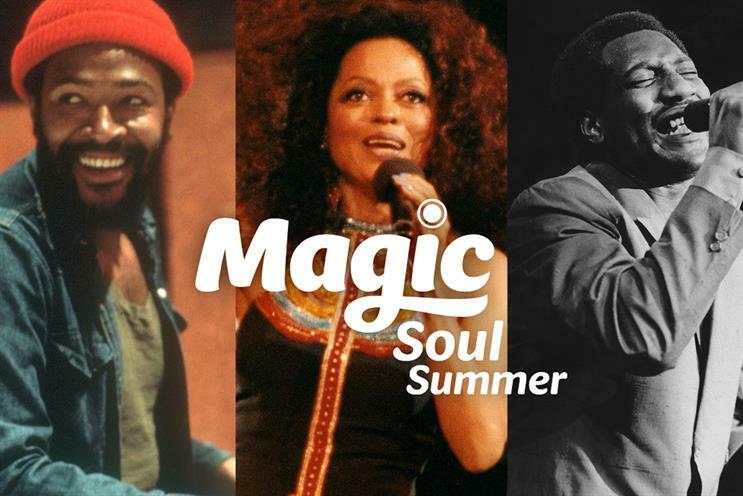 Bauer Media is continuing its strategy of developing sister stations for its key brands with the launch of Magic Soul Summer, a digital radio station playing soul and Motown. The station launches today (4 July) and will play hits from the likes of Otis Redding, Marvin Gaye, Al Green, Stevie Wonder, Luther Vandross, Chaka Khan and Aretha Franklin as well as more modern stars such as John Legend for the next ten weeks. Magic Soul Summer will carry spot advertising, which will be sold as part of Bauer Media’s national network of stations. The station will also be available for sponsorship and promotions. Tony Moorey, group content director at Magic Radio, said: "Soul and Motown music transcends generations and has an incredibly special place in the hearts of the Magic audience. Digital radio is a great enabler of choice and allows us to create pop-up stations like this that really broaden our appeal to listeners." Listeners can tune into Magic Soul Summer by retuning their DAB digital radio in London, Birmingham, Teesside, Tyne and Wear, Humberside, Leeds, Edinburgh, Northern Ireland, Tayside (including Dundee) and Inverness. The station will also be available in the rest of the UK through Magic’s website and apps. Magic Soul Summer replaces the Abba station Magic Mamma Mia!, the digital station Bauer Media launched in association with the Mamma Mia! musical based on Abba songs on 5 May. The existing Magic stations include the main Magic Radio, which has 3.6 million listeners a week, as well as Mellow Magic, which features hosts such as Patsy Kensit and John Hannah, and Magic Chilled. Dominic Williams, chief trading officer at Amplifi, said: "With the growing opportunity to launch new radio stations more cost effectively through digital platforms, radio stations are creating more niche opportunities to cater more specifically for listener’s moods. "Stations are investigating listening spikes during particular shows and this insight is driving new station creation such as Kisstory. With greater choice comes a better user experience with listeners having a more tailored experience. "This has been demonstrated in the latest Rajar listening figures with the slightly more niche commercial stations being the real winners: Capital Xtra up 42% year on year, Kisstory up 27% year on year, Jazz FM reaching 1m nationally for the first time and Absolute 80s hitting 1.7m." Many radio broadcasters have launched sister stations to their main station in recent years, including Global Radio, which rebranded Choice as Capital Xtra, and talkSPORT, which introduced talkRADIO in March.